Used when the vertical blind is to be fitted inside the window recess. Take the smallest of these measurements. This is the recess width. We will make the necessary deductions for the fittings & brackets to ensure the blind operates perfectly within the window recess. For vertical blind recess measurements a deduction of 1.5cm in total will be made on the head rail width. This will allow an operating clearance of 0.75cm at each side of the head rail. 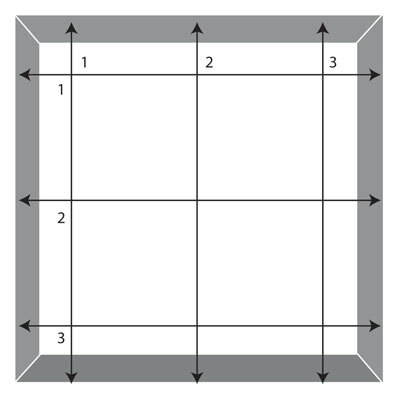 Take 3 measurements for the drop of the window recess as shown in the picture. Take the smallest of these measurements. This is the recess drop. For vertical blind recess measurements a deduction of 1cm will be made on the drop of the blind to allow for an operating clearance at the bottom of the blind. PLEASE NOTE that the complete size of the blind includes the headrail and all the brackets etc. Used when the vertical blind is to be fitted outside the window recess. Decide how much you wish to overlap the recess at each side. We recommend at least 75mm or 3 inches each side to avoid gaps of light. Take the overall width measurement including the overlap. This is the Exact Blind Width. We will not make any deductions from the exact blind width measurement given. Decide how much you wish to overlap the recess at the top &amp; bottom. We recommend at least 75mm or 3 inches at the top if the blind is required to roll up fully above the window recess. Take the overall drop measurement including the overlap. This is the Exact Blind Drop. We will not make any deductions from the exact blind drop measurement given. Creation Designer Curtains & Blinds © Copyright 2015. By Quinic Media. All rights reserved.